Connecting with younger generations has always been challenging. For centuries, older people have felt that the youth speak a different language, and with the rise of texting and emojis as tools of communication, that communication gap seems to widen. Which is what makes Duke Blue Devils coach Mike Krzyzewski so remarkable. Coach K (as he's affectionately known to players and fans) is known for building quality relationships with his young players, despite being about 50 years their senior. He's also a proven success, having led his team to five national championships, the second most in college basketball history. As Coach K and his team gear up for another NCAA tournament run, it's time to shine some light on his successful communication style. According to a recent article in The New York Times, it hinges on his ability to speak his players' language. For example, Krzyzewski likes to take advantage of a popular app known as Bitmoji, which allows users to create their own personal emoji character, for use on social media and text messages. Coach K texts players his Bitmoji, along with short, encouraging messages to let them know he's thinking about them. 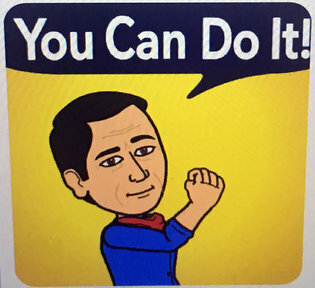 For example, in preparing for a recent big tournament game, Coach K sent a Bitmoji replicating a famous wartime poster, with the coach flexing his arm and declaring confidently: "You Can Do It!" "It's called communication," said Krzyzewski, simply. Duke's players say it works. "It's incredible to think he just turned 70," said Grayson Allen, one member of the team. "We don't feel that way." Another player, freshman Jayson Tatum, was surprised when his coach texted him a joke about Snapchat. "I was like, 'He knows about Snapchat?'" This isn't just an old guy trying to stay relevant. Some might scoff at the idea of using emojis and jokes about modern tech to communicate, but these are just small examples of Coach K's ability to communicate in a way that his players understand and appreciate. Show personal interest. Learn what young people like, what they're talking about. Use that information to grab their attention, and you'll have more opportunities to show them you care. Because when it comes to building trust, it's the little things that count.